West is my favorite region in Australia. I have been twice there and would love to go again. For some (unknown) reasons not so many tourist are going there, so you can find nicest beach just for you self and no other people for miles. Dampier Peninsula is of most remote places. The northernmost part of the peninsula is Cape Leveque there most tourist facilities are located. To get there you need to take rough road by four wheel drive or you can just fly. I didn’t have 4wd car, so I did fly and can’t complain about it as the view was fantastic. Here is one of pictures from the plane. I love this picture because is looks more like painting but not a photo of sea shore. 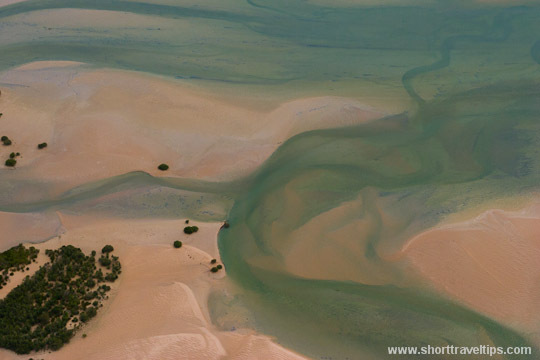 Wow, Dampier Peninsula is a very captivating place to travel. Australia itself very beautiful but travelling from uk make you very tired to reach there. what an absolutely amazing photo! How did you capture it? and how did you stabilize the camera on whatever craft you were on?